On Sunday (2/9/14) Sonny’s Super Stars joined up with the Southern California Meetup Group for their Mech Warrior game at SC Village. We ended up playing pump the whole day with the meetup guys (and gals) and had a great time. While standing around in the parking lot before taking off we got to see something really rad, Rick Galison’s Paintball Minigun. I grabbed my camera and took a quick video asking Rick some questions while he was locked out of his car and getting some footage of what looks like 8 or 10 Ion’s cleverly arranged into a rotating Paintball Minigun, with a Makita drill grips and fed from a side cylinder that must hold a thousand or maybe two thousand paintballs at a time? 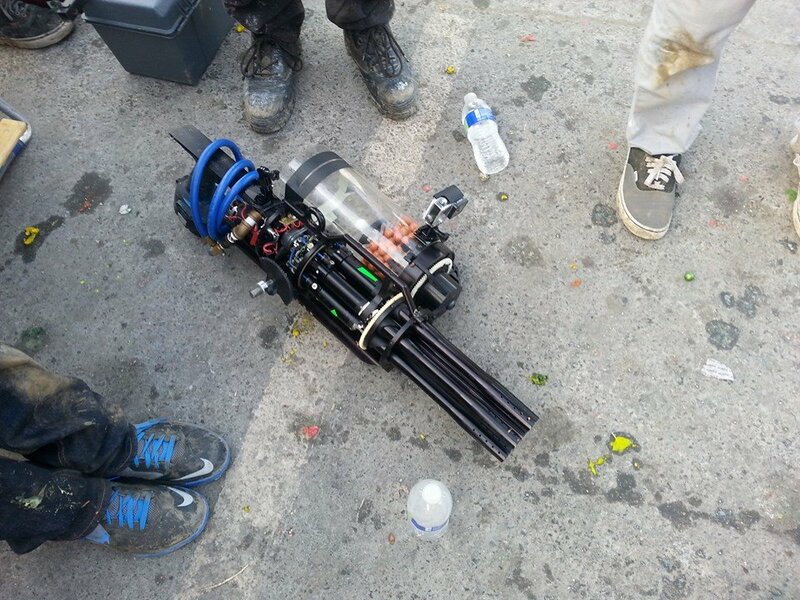 Rick Galinson’s Paintball Minigun on the ground at SC Village on Sunday, photo courtesy Jimmy Li. If you look up Rick’s channel on youtube under Tknofile2008 you’ll find some additional videos he posted as well as some of his other interesting projects (lego plane crashes, quad copter stuff, slow mov misc things and more minigun). There are also a ton of other videos of Rick demonstrating his Minigun from various spectators in the past. Here is one of my Favorites which is one of the few in a higher definition. It looks like Rick as gone through several variations of his Minigun and sounds like what he was wielding Sunday wasn’t even his latest version. I wish we could see this firing in person and even though it’s just about the complete opposite of what I normally post it definitely is one of the most innovative paintguns I’ve seen recently and also the baddest by far. Find more videos in this playlist I put together. I will need to look through my photos and see if I have some pictures of Tippmann’s Hellhound Paintball cart with the build in Turret Minigun. I’ll post those soon if I do. I think I took some at Tippmann’s World Challenge at Hell Survivors several years back when I played there with Weltman and Damage Inc.
Timothy Kerigan shows off his brand new CCM SSR rifle, which is a bolt action rifle built at Chipley Custom Machine for shooting first strike paintballs. A quick look at the Para Ordnance Mod 85 Fully Automatic or Semi Automatic paintball pistol, built in 1985. I am really curious how the loading system actually works. in order to force feed 6 rotating bolts, I would think there would be a ring/track around the 6 markers that allowed a ball to be pushed/fed in on each rotation… I’m really interested in this tech! Neat idea. Quite a few breaks and rollouts though. What a total waste of paint! I WANT ONE! Very fun, thanks, Dan.